The amazingly innovative team at PixelKit is awarding three Annual Membership Subscriptions to our readers! What an incredible way to start your day! Three lucky winners will gain unlimited access to PixelKit and thousands of the fresh and modern graphics that are ideal for any web designer! Why are these graphics so good? Because it’s all PixelKit does! 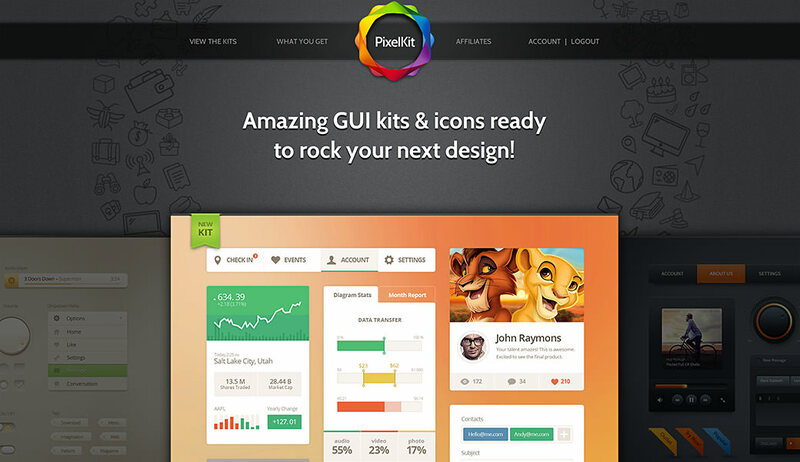 The PixelKit designers specialize in UI kits including terms of navigation controls, app screens and more. Browse through their gallery and you’ll find all of the design elements you could ever want! Check out some of the UI kits and icon sets that you will gain access to with PixelKit. Add these stylin’ vector outline icons to your metro or playful website or app. This clean lined and geometric flat UI kit will guarantee functionality to any website. The simple yet well-balanced font in conjunction with the paddings, margins and colors will bring both a retro and modern flair without distracting from your content. For a fresh and youthful vibe, try these shopping icons! These 30 pixel perfect icons will give your ecommerce website or commercial online store an updated look while also providing most “call-to-action” needs. Finally, a UI that is as fashionable for your trendsetting shopping website. Fashion Ave is an eCommerce UI Kit that is specially designed for this niche market. This couture look is sure to make your website stand out this season! Perfect for the design minimalist! This set includes 1000 simple yet detailed vector icons in over forty categories. Ideal for any commercial project need. This UI kit grants your users a vibrant yet easy site to navigate. The clean shapes and bright colors will efficiently deliver your message on either a website or app. Tell us why you should win by leaving us a comment. Make sure to include where and how you will use PixelKit and their premium graphics! Tweet away on the Twittersphere: Win a free @PixelKitcom Membership Account from @[yourTwitter](RT to Enter). Sounds pretty good right? Not only do you save time, hassle and energy, but you also get high quality UI kits immediately! You can start and finish your projects in record time. Here’s a treat to get you salivating even more — the Download these cutting edge HTML templates and up your site or app’s cool factor. They will entice your visitors to keep coming back for more!